It all began in 2015 when the then British Prime Minister David Cameron, advancing his election chances, promised the British people a referendum on membership of the EU should his party win the election. Cameron won, the referendum came about, the people decided. With an attendance of 72%, the people chose to leave the EU (51.9% (older/less educated) against 48.1% (younger/more educated)). On February 8, 2017, the House of Commons confirmed the peoples vote with an overwhelming 80% majority in favour of withdrawing from the EU. On March 28, 2017, the intention to withdraw from the EU was officially transmitted to Brussels, without conferring with Parliament in advance what kind of relationship the UK should seek with the EU, post-Brexit. Chaos ensued: the Tories were (and are) hopelessly divided and Jeremy Corbyn, a convinced Eurosceptic and leader of a party which could not choose between remain and (what kind of) leave, was (and still is) unable to make up his mind. At no time there has been any consensus about what sort of Brexit the UK pursued. 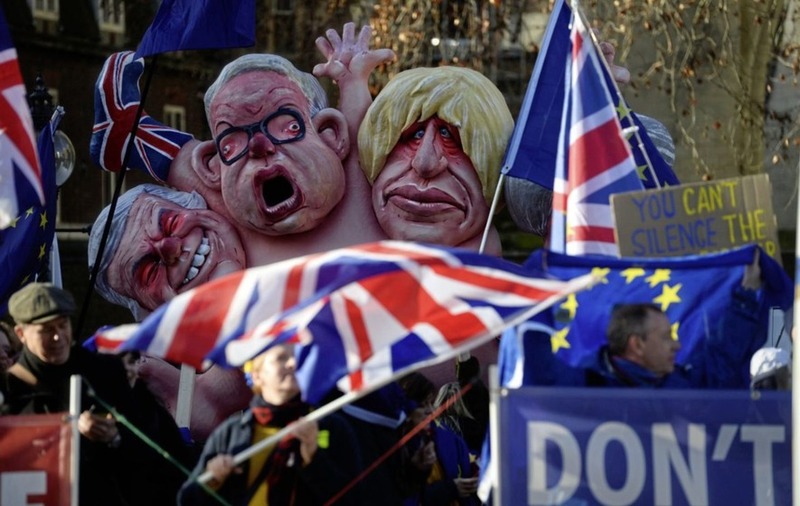 This was the backdrop against which the EU (obviously not supportive of the withdrawal in the first place) had to negotiate with the United Kingdom. Given the two years deadline in which to finalise a Brexit-deal, it had to organise this process of separation as best as possible. We now know where this has led. It is incomprehensible and extremely tragic at the same time, that the British have erred entirely on the EU's position on the negotiation process, the stakes involved and the legal implications of the withdrawal. Time and time again during the run-up to the referendum Leave indicated that the exit would be easy: "Getting Out of The EU Can Be Quick and Easy - The UK Holds Most of The Cards in Any Negotiation". For a long time, the UK entertained the thought that it would be possible to redeem the benefits of a link with the EU, without having to share the disadvantages ('Have The Cake and Eat It Too'). The British have seriously miscalculated the possibility to play the EU countries against each other and overestimated their ability to dictate the conditions for the Brexit. The Leave-campaign was vested in these false assumptions; people voted on these assumptions. Once these assumptions were disproved, the whole case for Brexit more or less collapsed. Brexiteers, obviously confused by this unexpected turn of events, were forced to come up with alternative approaches which subsequently gave rise to conflicting opinions on how to proceed. In this light, it is somewhat odd that more than a few Brits have accused the EU of arrogance over their rejection to facilitate the British demands. The results of the polls conducted on 15 January or shortly before, in summary, tell us that according to many British people it was wrong to vote to leave the EU and is undesirable to hold a second referendum to reverse this. There is less support for Jeremy Corbyn’s approach towards the Brexit then there is for Theresa May's, provided, however, that the voter has some clue at all, what both leaders and their parties really want. The most favoured scenario is now to enter into a customs union, and those polled advise MP's to vote down the Brexit-deal (on January 15). 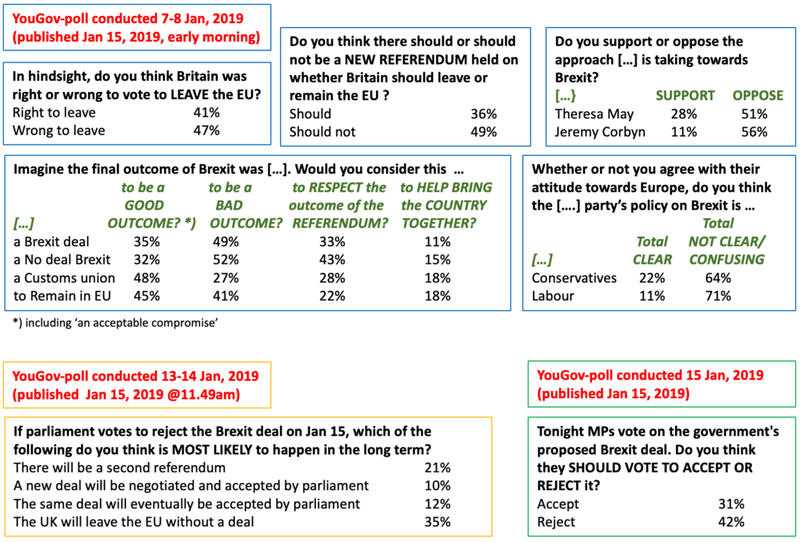 Should the Brexit-deal be voted down, those surveyed expect a no-deal Brexit to be the most likely outcome in the long run. Popular vote and opinion provide challenging results, taking both seriously is a severe hazard and executing on them is likely to cost you your job. A 'better’ recommendation for direct democracy is hardly conceivable! One should not forget that the British entered into the Brexit-process without having any (realistic) idea what they were after or how to implement 'it'. Not only does this apply to the Tories, but also to the Labour Party. The Leave/Remain dividing lines ran run right through parties, and the interpretation of what Leave actually entails are wide and varied. In this light, it is mildly hypocrite to scapegoat Theresa May for failing to achieve those (undefined) objectives in the negotiations with the EU. Given the high, but utterly unfounded, expectations, the disappointment was inevitable. You can say that it was naive of May to accept the assignment to lead the Brexit-process from the UK's end. You can blame her for having had little or even no consultation on this matter of national interest with the opposition. The forces and expectations however, within her party as well as outside, were such that there was an absolute belief that the EU had more to lose than the British side and that the British had the upper hand in the negotiations. On 17 January 2017, May held a speech in which she set out the 12 priorities for the Brexit-negotiations. On 8 February following May's speech, 80% of MP's voted to trigger Article 50, thus formally approving the UK to withdraw from the EU. Such massive approval is a clear indicator that the opposition as well, had little understanding of the realities at hand. This makes them co-responsible for untimely invoking Article 50 and as such their hands are tied to this deal as well. Given the populist pockets and threats on the mainland, the UK at least must have had a notion of the European steadfastness to operate as a unit, to keep the ranks together and to do their utmost to make a case for not being able to exit the EU on 'comfortable' conditions. Nevertheless, the British have chosen to trigger the two years Article 50-clock without a defined and realistic plan, let alone a strategy toput their objective into effect. The British have been guilty of blind self-overestimation, perhaps even an unsubstantiated superiority feeling and have showcased a perfect 'nation/island-centric' mentality. Once embarked on this path, there was no credible way back. The expectations were aroused, giving up was out of the question: 'Keep Calm and Carry On!'. May would have been one of the first to have experienced that the EU was not prepared to follow the UK playbook. In her contacts with EU heads of government, it must soon have become clear that Brussels was in the driver's seat, rather than the UK. This reality has never actually sunk in with the hard Brexiteers headed by Jacob Rees-Mogg. They presumably regarded May as a failed negotiator (woman, Remainer, socially awkward?) and expected to be able to bully her to their approach. In short, they refused to investigate the shortcomings of their own beliefs and prejudices (in particular their ‘Confirmation Bias). This refusal to embrace reality has ultimately led to the devastating defeat May suffered in Parliament on January 15. Only 202 MP's supported the PM while 432 voted against, including 118 conservative MP's. Subsequently, May survived the vote-of-no-confidence called by Jeremy Corbyn after her harsh defeat in the Commons. withdrawal of the article 50-Intention. With the possible exception of one, no parliamentary majority exists for any of these scenarios. I won't go into possible procrastination scenarios as I suspect that they are only valid if the British put forward a concrete proposal which can count on sufficient support in Parliament. It does not help either, that the elections for the European Parliament are imminent (23 to 26 May). The seats (73 in total) vacated due to the UK leaving the EU have already found a different destination. The total number of seats in parliament will be reduced by 46, and the remaining 27 British seats are to be distributed amongst some countries that are currently under-represented in Parliament. Extending the official UK-exit date beyond the European Parliaments election, would involve the UK in these elections. No one is eager for that to happen. A no-deal Brexit being so destructive, it is highly unlikely that any of the parties involved would actively pursue this route. It is ultimately up to the British to prevent this from happening, assuming the EU will never take the first step to break the deadlock on the withdrawal agreement as it would work against the EU at every successive withdrawal situation. Should the UK, however, does decide to play this card, it would risk destroying all remaining goodwill in and with the EU (particularly its closest neighbour, Ireland), it would play poker with the future of Northern Ireland as well as putting the safety of citizens in and outside the (North) Irish border area at risk. Economists having run the no-deal scenario, predict a long-term dip in GDP in the range of 2.8% to 4.4% compared to a negotiated Brexit deal (studies cover a 15-year horizon). This would not only significantly affect business (import duties, bureaucracy, trade restrictions, deviating regulation, etc. ), citizens as well would be hard hit. The Tories would be held responsible for plunging the country in chaos and turmoil. Either May resigns, and possibly call new elections, or the opposition tables another no-confidence-vote which the government would then surely lose. The Tories are guaranteed to suffer a significant defeat in the resulting election (even if its alternative, the Labour party, does not command much sympathy either). Despite all that, it is quite understandable that the Tories still keep this option open. It provides them with an essential weapon in the negotiations with the EU. It is a 'nuclear' option. You may threaten to use it, even if you are fully aware that using it is equivalent to self-destruction. Without this option, however, they will not reach their objectives anyway. Corbyn's demand that this 'nuclear' option should be taken from the table before participating in any discussion on 'Plan B', is empty and probably just a way to avoid being part of any solution at all. In this scenario the UK, after withdrawing from the EU, would enter into a customs union with the EU and have an open border between Ireland and the UK. This outcome is Labours' preferred scenario, but as it is undefined, it still very much is a vague concept. Customs unions in general only relate to a defined range of goods and not per se to the whole spectrum of goods as is the case in the current internal market. The conditions under which a customs union with the EU is open to the UK, depends on the chosen starting points. Should the UK want to bring more goods under the workings of the Customs Union, it should be prepared to accept more regulatory and possibly financial burdens to come with it. Turkey, for example, has a Customs Union with the EU with quite a number of important exclusions (e.g. agricultural products), but is nevertheless required to incorporate EU-regulations and technical restrictions on trade into its legislation. The various customs unions with EFTA countries (European Free Trade Association with Norway, Finland, Iceland and Switzerland as members) go way beyond that. It is like being part of the internal market, but comes with substantial obligations regarding incorporating regulation into UK law and making financial contributions. Without British concessions in the area of free movement of persons, this is not a viable option. More importantly, it would exclude the UK from all EU discussions on the rules to which it would be subject. This does not constitute 'Taking Back Control ' which was the prime objective of Leave/Brexit in the first place. Although the above opinion polls seem to imply that this scenario has the most support, how certain is it that those surveyed (and others) fully comprehend the implications involved? More importantly, this option can only be established if MP's cross party lines, defy party leadership in doing so and thus effectively seize power in the House of Commons. It is not impossible, but still very unlikely. It would seriously upset party structures (particularly within the Conservative party) while it would also require cooperation from Theresa May as head of government to buy time from the EU to conceive, prepare and put this plan to the vote. As things stand now, it is highly unlikely that May and the majority of her party are going to lend themselves to making this happen. This scenario generates a lot of attention (especially outside Parliament), but for the moment the opportunities seem limited. The only path to such an outcome seems a second referendum. As long as the May ministry still is in power, it is almost impossible for such a proposal to get sufficient support. Labour is too much caught up in their own challenges and struggles. Does it want new elections and have Corbyn in 10 Downing Street as PM? Would it risk a referendum and possibly a defeat (as most Brits are still against a second referendum)? Despite May's declining popularity, there is no indication that Labour (under Corbyn?) has any chance of winning a new general election. Should Corbyn push for a second referendum, as unlikely as it seems, he has to deal with threats that part of his political leadership will step down. The Conservatives too, have little to gain from a referendum. Their political capital is built on Brexit, and now they would risk all that and support a possible reversal of their policy? A majority of their supporters (67%) still think that it was the right decision to exit the EU. What happened to democracy and leadership? Also, it would be extremely unclear and a matter of considerable debate, which question to submit to the voter. The same or a more layered question? What discussion would ensue and how to secure the desired result under this scenario? As long as the Conservatives are in power, it seems unlikely to me all this would actually happen. Provided the Conservative government remains in power, this scenario to me seems to be the most likely one. As March 28 approaches, the probability of a no-deal Brexit further increases. If that situation would materialise, the infamous 'backstop' (the obligation imposed on the UK by the EU, to keep the borders open between Northern Ireland and Ireland even if parties fail to achieve a relevant free trade agreement), would then be off. As such, this would not invalidate the obligations under the existing bilateral Good-Friday Agreement between Ireland and the United Kingdom. Despite a no-deal Brexit the agreement would stand, and should be respected, notwithstanding. Given the current deadlock and circumstances, there is no shame in having an amended Brexit-deal, therefore a negotiated separation, which allows the internal market to function post-Brexit during the agreed-upon transition period while negotiating a mutually needed solution without the threat of a backstop. This may not be ideal, but it reflects current reality and puts the responsibility in the hands of the two parties involved (Ireland and the UK). So far, the thinking has gone towards linking the freedom of movement to both people and goods. However, this linkage is absent in the Good-Friday Agreement. The word 'good(s)' is not mentioned at all in this context in the agreement, and why should it? The issues between Ireland and Northern-Ireland were people related, not transport or goods related. Given the fact that both the UK and Ireland are not part of Schengen this would create the opportunity to make a sort of mini-Schengen between Ireland and Northern-Ireland, at the same time respecting the (hard) border for goods and transport. One only has to look at the EU/Swiss (Switzerland not being an EU member, nor necessarily immigration friendly) for guidance as to how this may work. Apart from the backstop issue, the desired outcome as laid down in the Brexit withdrawal agreement is widely shared by most. Given the UK's desire to exit the EU, regain its sovereignty and reclaim control over its legal jurisdiction, a Free Trade Agreement makes the most sense (discounting the potential impact to its economy, but that is the choice made by the British themselves). The EU needs to respect that but is entitled to its own red lines in the process. The current negotiated deal and the ‘political declaration' sans Brexit, is the best guarantee for an orderly transition towards the next phase, security during the transition and compliance with all other agreements made in the divorce bill and annexes (some 585 pages of detailed commitments). By now, even the hard Brexiteers are well aware of the limited possibilities to force an amended deal. After Theresa May's defeat in the House of Commons on the Brexit-deal, Boris Johnson hinted that if the backstop goes out of the window, support for such an amended deal would materialise in the Conservative fraction of the House. Given the pressure many Labour MP's are in from their own constituencies they might even jump ship to support such a deal as well. In the absence of any other scenario that can count on sufficient support, this is the most feasible and best result for all parties out of this deadlock. For Ireland, a negotiated Brexit, is better than a no-deal Brexit. For the EU as a whole, this concession is acceptable and so specific that it does not create a precedent for windfall following possible subsequent exit discussions. Following the final exit-date, the time comes to negotiate the relation post-break-up. The intentions outlined in the 'Political declaration' to the withdrawal agreement will serve as the starting point for those further negotiations. This new round of talks can go in many different directions and are closely aligned to the political situation in the UK at that time. Should the current government remain in power, the relationship most likely becomes more distant and independent. If, on the other hand, new elections put Labour in power, the relationship is likely to be closer and more intertwined, possibly modelled on the kind of customs union the EU has with Norway or Switzerland. It is not a done deal yet. For now, the most probable outcome, in my opinion, is one that resembles the relationship between the EU and Canada (CETA). Provided certain conditions are met (like those on Rules Of Origin), this would result in the mutual reduction of import duties to some 98%. Within the 'red lines' of both parties (British autonomy versus EU's 'level playing field' regarding the free movement of people, goods, services and capital), this presumably is the maximum achievable. Given the events over the last weeks it is somewhat wry that EU negotiator Michel Barnier, provided this solution already as early as December 2017. At that time, however, it was labelled as not attractive enough for the UK and shelved. We have come a long time since. It once again something which has been observed time and time again: British politics are always unpredictable and never dull!